A slacker man in Canada who loves a girl that has seven ex boyfriends to defeat. He is also a bass player in an indie band with his friends to get fame among the scene. Despite it has simple story, the visualisation which taken from several video games ad popular cultures has become a point why I like this movie. Super Mario, The Sims, Zelda, Guitar Hero, and whatever popular games appear in the scene. If you know a lot abut video game you'll get the point and even you will laugh because its funny. You will like battle scenes instead boring triangle love story in this movie. I personally like the visualisation than the story, its hilarious when you see that something rarely found in the popular movies exists alongside the plot. Even all movies which based on video never show something that related with the games. 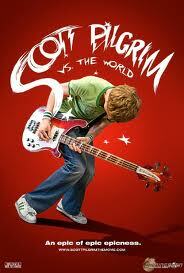 Anyway, that's it my review about Scott Pilgrim, the rest of the movie scenes look disturbing. If you have already watched, you may agree with me.